The lionfish (Pterois volitans) is an invasive species in the Caribbean. It was introduced through the inadvertent release of aquarium fish into the surrounding waters. Scientists believe that only 8 females and a small number of males, released in a few separate incidents over the past decade, account for the explosive proliferation of this animal in Caribbean ecosystem. Consequently, the populations of naturally occurring reef fish have been greatly depleted throughout the Caribbean in favor of this invading species. Like its terrestrial namesake, the king of the jungle, this fish had become the king of the reef! It eats voraciously (commonly eating fish that are 60% its own size), is protected by an array of venomous spines, and until recently, had no known reef predators that recognized it as a source of food. It is now known that large groupers and occasionally large snappers will gulp down this intruder and keep its population in check. Scientists have found that reefs with large groupers present have lionfish population approximately 10 times lower than reefs without big groupers. Unfortunately, both grouper and snapper are prized food fish and are notoriously overfished in the Caribbean to help feed the bulging tourist population that has come to expect a delicious grouper meal on the dinner menu. Curaçao (where this photo was taken) is known to be an island that has been particularly hard on its native grouper. Past studies have shown that poorly enforced spearfishing laws and severe overfishing in general has badly depleted the population of reef carnivores, including those species that would prey on lionfish. Divers have long criticized Curaçao reefs for the lack of large fish. 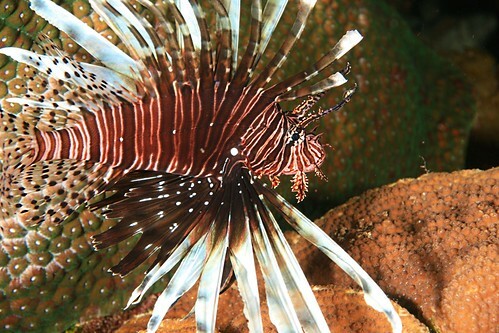 This may be the reason why the number of lionfish on Curaçao reefs has been particularly excessive. On my last trip to the island in 2010, I found lionfish to be both common and abundant. I really feared that the ecosystem was damaged beyond hope. But there is hope. Though I'm not a scientist and I did not perform a rigorous, controlled investigation, I believe that the population of lionfish is now either flat or even lower in Curaçao than it was two years ago! Expecting to find the lionfish all over the reef, I was surprised to find the opposite to be true. Oh, they are still there, but were scarcer than in 2010 and much more wary when approached. The reason may be the presence of large, predatory groupers! I've been diving Curaçao for over a decade now and have never seen a really large grouper... never... until this trip, that is. On two separate reefs (Playa Forti and Playa Kalki), I encountered Tiger Grouper about 4 feet in length. Again, this is not based on any scientific study, only my own personal experiences, but I found this to be an encouraging sign. The Tiger Grouper is a native species known to grow to large size. (Paul Humann's identification guide puts the upper size of these fish at 3 1/2 feet but I challenge this based on what I saw). I remain optimistic about the future of the reefs surrounding Curaçao. I don't know the entire story as to why large grouper are making a comeback, but I hope that it has something to do with a change in human behavior or recognition of the effects of previous overfishing. I don't know the reason. Anyway, the next time you are in the Caribbean, do me a favor. When you are trying to decide what to order from the menu... try the chicken!